Dwight came to Vassar in 1878 after already having had a long and distinguished career. His primary training was in geology and minerology, but as the Theory of Evolution became to be more widely accepted, by the 1890s the department began to put more emphasis on the study of zoology. Dwight’s class in Paleontology only grew more popular as the years went on, and clearly he felt that the enhancement of the Natural History Museum’s collection added to the class. In 1895, an excavation in Circleville, Ohio, recovered a partial mastodon skeleton, and Dwight talked with a Professor Moorehead at the University of Ohio about purchasing the Circleville mastodon for display at Vassar. The skelton was purchased, and rounded out with plaster casts and bones from approximately eight other mastodons. A femur and pelvis came from Indiana, and two complete tusks were purchased in Ontario. Taxidermists E.H. Eaton and A.P. Wilbur worked with Dwight on the project, taking measurements and casts of the Cohoes Mastodon in Albany to complete the skeleton. In 1902 the mastodon was completed and erected in the museum in the Museum (Avery Hall) as part of the college’s teaching collection. Dwight was clearly excited about the addition to the museum, as in 1897-1898 the Paleontology class placed special emphasis on extinct forms, and in 1899-1900 the senior seminar topic was “Extinct Vertebrae Fossils,” followed by “Advanced Paleontology of Fossil Vertebrae” in 1901-1902 and a course covering “characteristic forms of life and climate change” in 1902-1903. 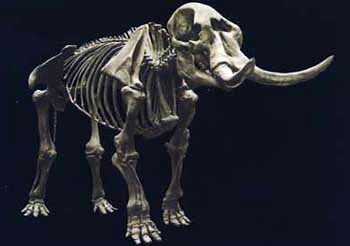 Dwight retired in 1905, shortly after the mastodon was completed. The skeleton remained in Avery until 1918, when the museum was relocated to the New England Building, and the mastodon was installed as the centerpiece of the collection on the floor. Slowly over the years, however, the museum fell into disuse and fewer and fewer people remembered the origin of the mastodon. It remained in New England until 1986, gathering dust and growing slowly more forgotten, when someone, believing that the mastodon was nothing more than a plaster cast, left a note for the janitor on the third floor of New England building instructing him to promptly dismantle the nine foot tall and twenty foot long skeleton. 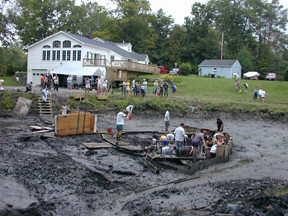 Vassar students and volunteers at the excavation site. Fortunately for the mastodon, an art professor saw the note and contacted someone at the Museum of Natural History in Manhattan, who told him of the skeletons’ value and proposed the State University at New Paltz as a possibility for its new home. The professor spoke to Russell Waines, a Professor of Geology at New Paltz, who agreed to take it. The mastodon was dismantled and the bones were transported across the river to New Paltz. 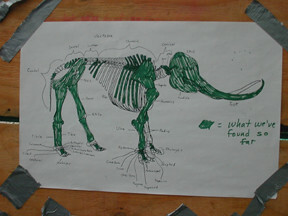 Waines had many plans for the mastodon, including an “adopt a bone” fundraiser and a display featuring Native Americans with spears in a hunting scene, but lack of funding and a wealth of bureaucracy impeded his efforts, and the bones remained scattered and unassembled in the basement of the New Paltz Geology building. 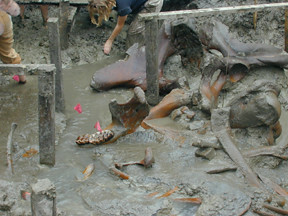 Renewed interest in the mastodon was sparked at Vassar in 1999 when Hyde Park resident Larry Lozier uncovered a bone while deepening a pond in his backyard. The bone proved to be the upper forelimb of a mastodon, and the rest of the skeleton was uncovered in August 2000, with help from a team of volunteers that included members of the Vassar geology department. Acampara, Denise Marie. “Tracking the Mastodon from Vassar College.” SUNY New Paltz Newsletter, January 1989. Hoffman, Mala. "Them Bones, Them Bones, Them Mastodon Bones." Ulster Magazine, Winter 1999. Lipeles, Jason. “Vassar Mastodon Bones Face Uncertain Future.” Vassar Miscellany News, January 28 2005.